Editor's note: This version corrects links for the interactive map and 2016 report, and adds I-280 to the list of San Francisco Bay Area hot spots. Collisions involving vehicles and wildlife along California’s highways cost more than $225 million annually, according to a new UC Davis study that uses traffic-incident reports to identify hot spots of concern for both public safety and wildlife conservation. Data from state data sources indicated there were about 560,000 traffic incidents from February 2015 to February 2016, about half of which were collisions. Of these, 5,950 involved wildlife. A database of these wildlife vs. vehicle events was developed primarily from incident reports prepared by the California Highway Patrol and other emergency responders. The 2016 report pinpoints stretches of highway where wildlife-vehicle conflicts occurred in 2015. These cases involved animals running across the road, vehicles colliding with wildlife, or accidents that occurred when people swerved to avoid hitting wildlife. The researchers estimate that as many as 50,000 deer are hit by vehicles annually in the state. 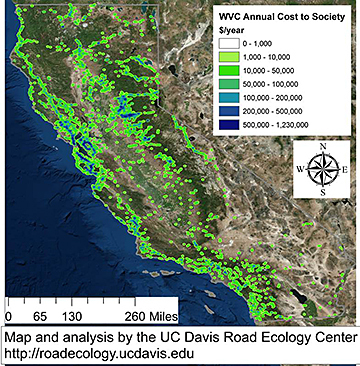 “By identifying the cost and locations of these conflicts, we hope to help state and local government entities better protect wildlife and drivers from collisions,” said Fraser Shilling, co-director of the UC Davis Road Ecology Center and director of the California Roadkill Observation System. “Since the cost of wildlife-vehicle conflict equals about 2 percent of California’s transportation budget, it would seem reasonable to earmark 2 percent of that budget for efforts aimed at preventing incidents that threaten the safety of both animals and people,” he said. An interactive map shows locations of incidents involving wildlife throughout the state, for the fall, when collisions are more likely to occur. How Fast Are Ice Shelves Really Melting?